To make a long story short, before Sashi's surgery, we planned a sort of mini-vacation to Minnesota, where my husband works about two weeks per month. After her surgery, I really struggled with whether or not to travel so soon. Our plan was to drive from StL to Minneapolis - about a nine hour trip by car - and spend a little less than a week touring the city while Daddy worked. I didn't want to regret not trying to go. There are a finite number of opportunities we have in this lifetime to enjoy each other in unfamiliar adventures. 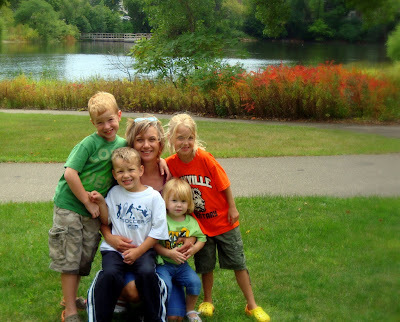 I wanted to go and enjoy a new city with my kids - and to see a side of my husband's life we only hear stories about. I finally settled on the idea that we would go, and if needed, we would find a hotel room and return home if Sashi seemed to be in too much pain from the lengthy traveling. I was nervous, but we forged ahead. Let me just tell you, we enjoyed a wonderful week. Sashi did remarkably well - especially since we dragged the car ride to a lengthy 11 hours! (We stopped frequently and enjoyed sit down meals instead of our typical eat-on-the-run!) We enjoyed the apartment and the area where JT lives while he works in Minneapolis (and saw the most amazing tree house ever!). 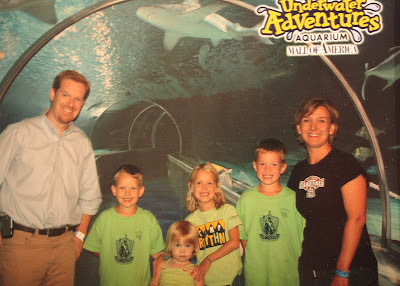 We loved the aquarium and Mall of America in its entirety (though it proved challenging to keep track of four kids on the run while flying solo on a Friday there in August - despite their matchy-matchy clothes a-la Jon&Kate+8 ~ pre-divorce). 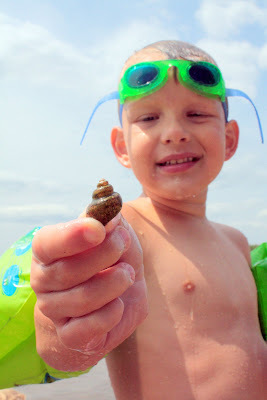 We spent time with my 'long lost cousin' and her family on a Minnesota beach - and brought home our own special version of beach shells! JT and I shared a beautiful (albeit chilly) riverboat cruise with his employees and coworkers. And we made it safely back home about 2:00 this morning. Sometimes we fear the unknown. I'd say it's safe to say I always fear the unknown - and often even the known! It's a beautiful thing to face fear, see yourself through it (by the grace of God), and to look back on the loveliness with a smile and fond memories. That's what this week felt like: a beautiful thing.